The Bill of Materials System in an ERP software solution facilitates an accurate expected cost against which to track actual production costs. The complete bill forms the basis for material and capacity planning, shop floor control and costing. The best ERP software give you the ability to create and maintain a model of your manufactured or assembled products as well as generate what-if costing scenarios. 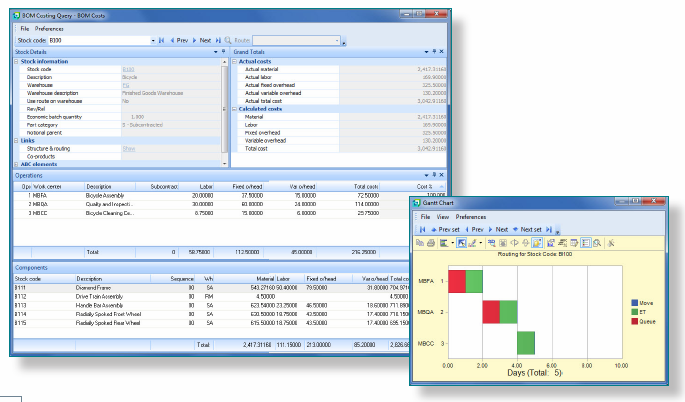 The Bill of Materials system in an ERP software system enables you to construct quantity or percentage relationships between assemblies (final product) sub-assemblies (bulk batches) and components (raw materials) using up to 15 levels and you can assign each component to a selected operation in the parent routing. The image you see above is an example screen shot from the award winning ERP software SYSPRO. If you are considering an ERP software system, consider using a checklist for 'must have' features. Possibly your company may fall into the category of "under-utilized" or "broken" production cost management where you have a disconnect between the expected cost vs. the actual cost. An ERP software expert will break down the essentials for you and if they are worth their salt, pay for their services many times over.